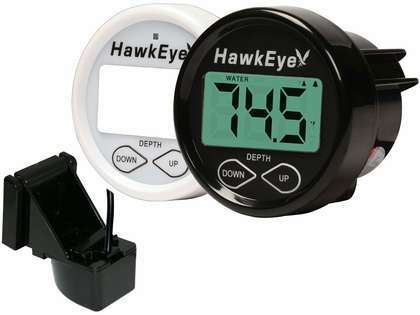 The HawkEye D10DX.01T Boat Mount Depth Finder with Transom Mount Transducer includes all of the advanced sonar, keel offset, and depth alarm capabilities of the HawkEye D10D, but adds dual temperature displays. With a simple press of a button, you have instant access to air or water temperature readings via integrated sensors in both the head unit and transducer. Interchangeable white and black face plates and bezels are included, as well as a sun cover to protect the LCD when not in use.